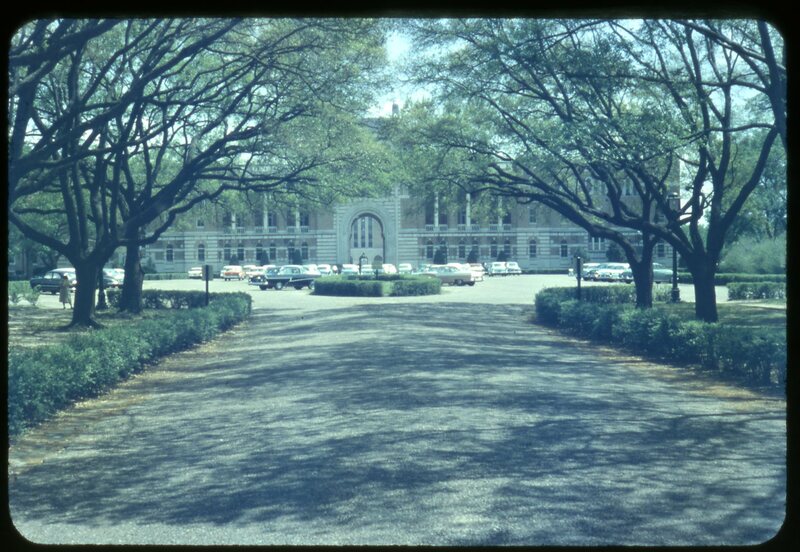 Yesterday one of my beloved colleagues in the Woodson showed me something wonderful–several small boxes of slides taken by an alumnus during his student days in the 1950s. He recently sent them to Alumni Affairs and they in turn sent them on to us. They are beautiful, clever, adventurous images taken by someone who was thinking as he walked the grounds . . . and as he climbed up on top of things as well. His name is David Davidson ’58 and all I know about him so far is that he lives in San Antonio and he was a MechE. I am fixing to sit down and write him an effusive letter of thanks. I am so grateful. There are a lot of these images and many of them are worthy of discussion here. I’ll start tonight with a few that hint at the delights to come. First the view from the Main Gate–is that asphalt? The next one had to have been taken from the top of the brand new Biology Building. Note that there seem to be not one but two shacks behind the Physics Building. Note also that wonky lamp post by Anderson Hall, which I talked about way back in 2014. 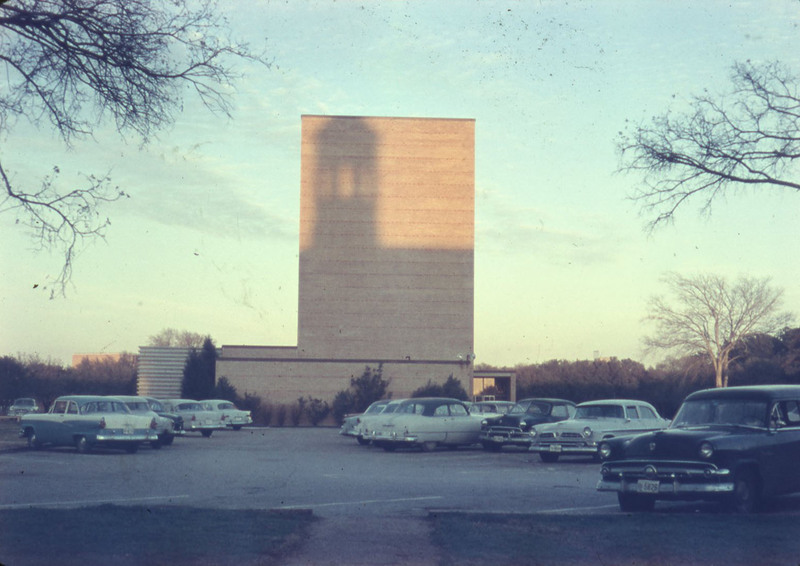 I nearly swooned when I realized what it is–the shadow of the Chemistry Building tower on the building that housed the Nuclear Research Lab (later called the Bonner Lab). It called to mind the photographs taken by Bud Morehead of shadows on buildings, but those can all still be seen if you happen to find yourself in the right place at the right time. This one is gone for good, except in this picture. You nearly swooned? lol!!! I loved that comment and love your journey through the Rice annals that you take us. Thanks! And you should see me when I get something my hands on something like this–I can go from laughing to crying to back to laughing again in five minutes. I may have been doing this job for too long. “swooned”: The Old South in Melissa erupting. “… I am fixing to sit down” shows the Texican in her blossoming. The statues may disappear (at night), but our language marches on. I loved the way Bonner looked. It was a sad day when we lost that. I’m grateful for the clear view of Anderson Hall before the alterations/additions. 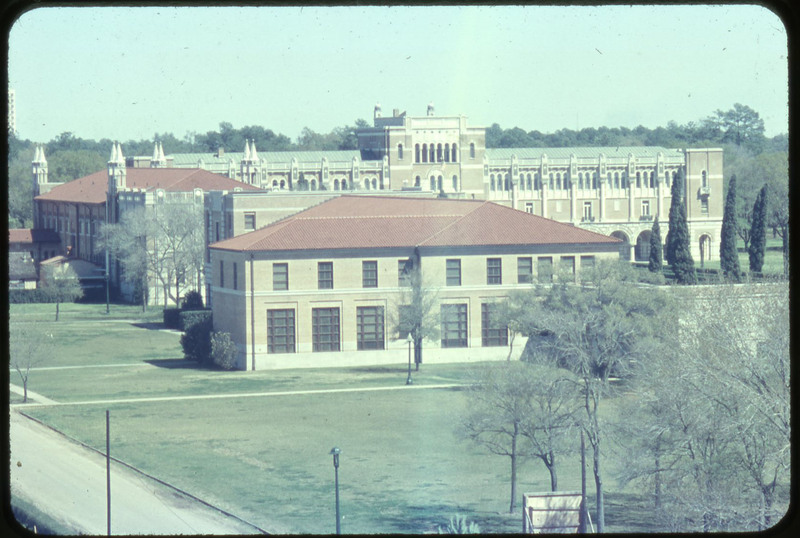 That’s where I spent most of my four years at Rice! Aren’t we glad that parking lots got moved to the periphery of the campus? I have mixed feelings about that. Especially when it’s raining.